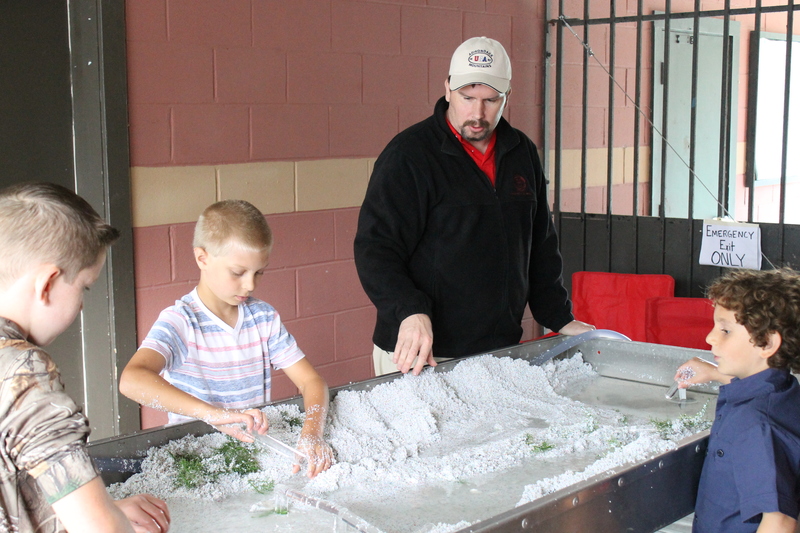 On Fri­day, July 31, AWSMP staff mem­bers from both Cor­nell Coop­er­a­tive Exten­sion of Ulster County and the Ulster County Soil and Water Con­ser­va­tion Dis­trict will be at the Ulster County Fair per­form­ing a stream table demon­stra­tion. The demo will run from 11:00am to 3:00pm and will be held in the Jane W. Bar­ley Youth Building. Man­u­fac­tured by Lit­tle River Research and Design, the Emriver stream table sim­u­lates river processes by uti­liz­ing a spe­cially designed alu­minum table sup­ported by saw horses and con­nected to a large 27 gal­lon reser­voir by plas­tic tub­ing. An elec­tric pump moves water from the reser­voir to the end of the table that pours over a col­ored ther­moset plas­tic medium that mim­ics the weight and con­sis­tency of real sand. The force of the water is con­trolled by a throt­tle to sim­u­late draughty, nor­mal, or flood con­di­tions. The water inter­acts with the medium show­ing users how nat­ural ero­sion and shap­ing of stream chan­nels takes place. Dif­fer­ent demon­stra­tions such as plac­ing bridges, cul­verts, riprap or even veg­e­ta­tion using plas­tic props can be used with the table to show how these items affect the evo­lu­tion of streams. Using hands or tools to scoop out sed­i­ment can show how real-life actions such as chan­nel straight­en­ing or dredg­ing impacts stream sta­bil­ity. The stream table is a great teach­ing tool to edu­cate oth­ers in a rel­a­tively short amount of time about processes that shape and affect streams over decades or centuries. So come on out to the fair and stop by the Youth Build­ing to see AWSMP and the stream table in action. Be sure to check out the other exhibits and pick up one of the 4-H program’s famous milk­shakes at the snack bar. See you at the fair!